These days, I am finding myself at one of two emotional extremes: either anything remotely sad or misaligned makes me want to dissolve into tears, or the smallest thing of beauty pushes me into inexplicable gladness. Unkindness and traffic jams make me wither. Afternoon sunshine and well-executed scones and friendly shopkeepers suggest that all (read: wedding plans, future plans, house cleaning plans, fraught international relations) shall be well–or, perhaps, even better, perhaps EXCEPTIONAL! I guess this is what happens when life is very full and changes are imminent and a girl feels far, far away from those days in which “Nothing, really” was the appropriate and honest (and oftentimes depressing) answer to the question, “So, what’s new?” I can’t say I feel particularly stable, mind you, but I do feel as though we’re in the midst of life in all its fullness, and that, truly, is a beautiful thing. These are the days in which a really good dinner–one full of fresh ingredients not so far removed from the earth, one that comforts weary bones and quiets a busy mind and fills an empty stomach–brings tremendous solace. Often, I find, a humble mix of green produce and bright lemon and a couple of simple eggs is just the thing to bring a bit of equilibrium. Something of this sort is a common dinner for me, particularly if I’m eating alone. I’ll place it atop polenta or a pile of whole grains or alongside a piece (or two) of toast, and I’ll pour a glass of wine. Calming, this meal, and simple and hearty and healthful and delicious. The recipe that follows is more polished than many of my variations on this theme, with more nuanced flavors that are worth the extra effort (and the consumption of extra butter, if you so choose). The ramps become almost caramelized and maybe even crispy, and they mingle with the asparagus to make the most wonderful mess of early spring green. And the egg, cooked as directed, has the most perfect yolk, I think–runny but not overly so, reaching its richness toward the greens surrounding it. 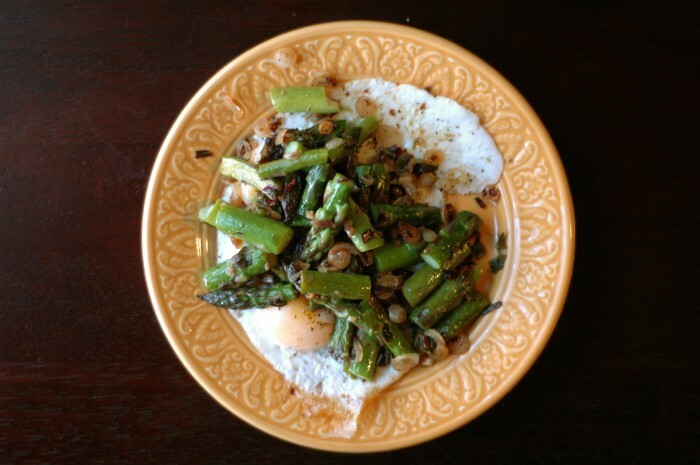 This meal tastes like spring, and like having your feet on the ground. That’s what I strive for myself these days, and it’s what I wish for you, too. You may not be able to get your hands on ramps any longer this spring, or perhaps you don’t find them at all in your local markets and shops. (This was my first year acquiring a bunch of the wild little things, and I was ecstatic!) If you have no ramps, save this for next year, and in the meantime, substitute a combination of leeks and garlic for similarly delicious results. Another potential substitution: when I first made this, I had no lemons, so I used dried lemon zest and lemon juice instead. This, also, is fully acceptable. Finally, I couldn’t bring myself to use the full amount of butter that Melissa calls for, so I dialed it back significantly with good results. I’ve given you ranges so that you can use the full amount if feeling decadent and less if simply setting a humble weeknight table. Trim off the bottoms of the ramps; discard. Remove the leaves and finely chop them. Thinly slice the white bulbs. 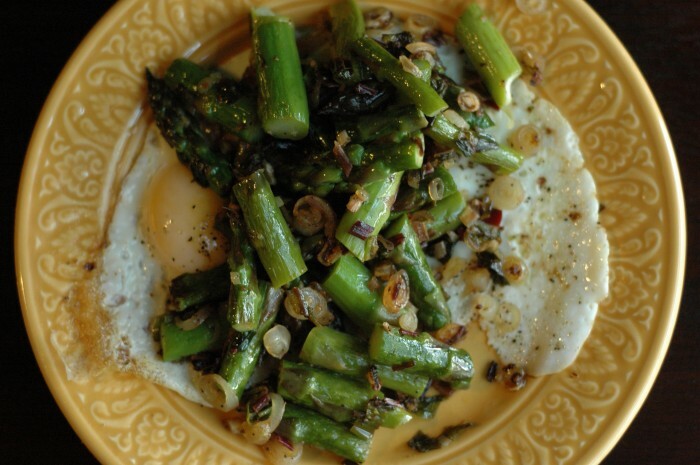 Snap off the woody bottoms of the asparagus; discard. Cut the stems into 2-inch pieces. In a large skillet over medium-high heat, melt 1 – 2 tablespoons butter. Sprinkle with 1/2 teaspoon salt and 1/8 teaspoon pepper. Add the sliced ramp bulbs and lemon wedges. Cook, stirring, until slightly softened, about 2 minutes. Add 1/2 – 1 tablespoon butter to the skillet. 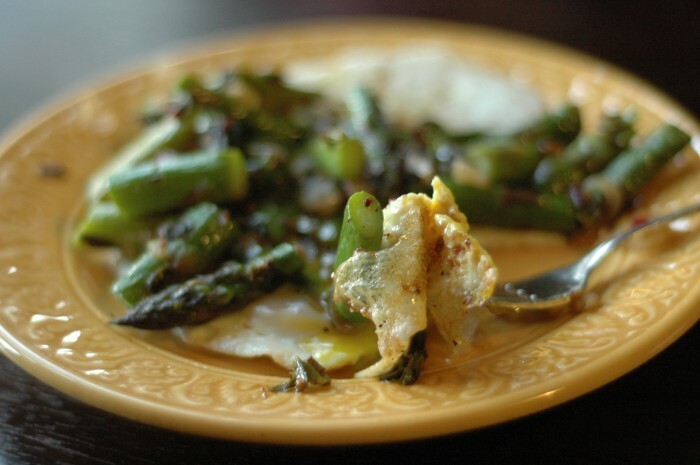 Stir in the asparagus, chopped ramp leaves and remaining 1/4 teaspoon salt and 1/8 teaspoon pepper. Cover and cook, shaking the pan occasionally, until the asparagus is tender, 4 to 5 minutes. Scrape the mixture into a bowl and set aside. Put the remaining 1/2 – 1 tablespoon butter into the skillet. Crack in the eggs, sprinkling them with salt and pepper. Cook until the edges of the eggs are set, about 2 minutes. Reduce the heat to medium, cover the pan and cook until the eggs are completely set, about 1 minute more. 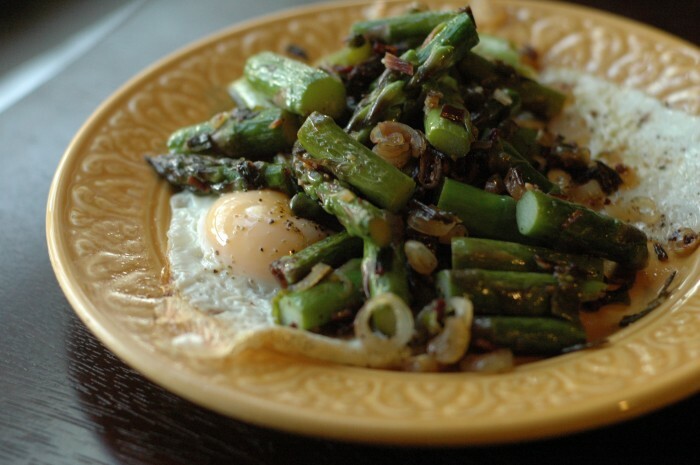 Serve the eggs immediately, topped with the warm ramp and asparagus mixture.